The METEOR 100/2 voyage started on Friday 4th of October at 09:30 from Walvis Bay, Namibia. The research expedition has a number of scientific objectives and provides the opportunity for African and German young scientists to learn from each other. The first study region is the Benguela Current and Upwelling System of the Namibian coast. In particular, we study the oceanographic setting of the upwelling system, including its filaments and small-scale structures. Moreover, we are interested in the distribution of trace gasses (CO2, CH4, and N2O) and compare its values near the coast and off shore. Finally the biological program is focuses on the distribution of plankton. In particular their vertical distribution in the context of the oxygen minimum zone underneath the surface mixed-layer, are of interest. We are physical, chemical, and biological oceanographers from Kiel, Hamburg, Bremen, Bergen (Norway) and South Africa. Additionally, a total of 20 bachelor, master and doctoral students from Germany, the USA, Namibia, Madagascar and South Africa complete the scientific party on board. 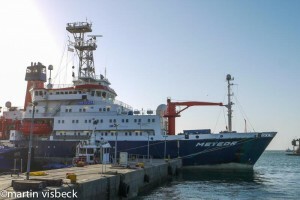 The METEOR is a 97.50m long multi purpose research vessel. She was build in 1986 and is capable to operate in ice-free water around the globe. The areas of research include the North and South Atlantic Ocean with frequent excursions to the eastern tropical Pacific, Southern Indian Ocean and the Mediterranean Sea. It has room for 28 researchers and about 30 crew. We reached the first station on the Namibian shelf a few hours after departure, where a CTD and a Multi-Net casts were undertaken. The wind strengthened overnight, and in the morning reached Beaufort 7. That together with growing wind waves make the work on deck challenging. On the second day, two successful CTD and Multi-Net casts were successfully performed. Between the stations we deployed an underway CTD while the ship is steaming 9 knots. The wind continued to strengthen, and in the late evening exceeded Beaufort 8. This hampered the further deployment of instruments and forced us to change plans and abort the planned zonal section. Since then the progress towards Cape Town, against wind and waves, was slowed down significantly. Over the weekend the working deck was closed because the waves frequently splashed on deck. The gale force winds are accompanied by strong waves but at the same time the sun is shining and the sky is blue. We are spending our time working on the data we have gathered so far an began a marine science lecture series on board. METEOR will be our home for the next two weeks and we will blog about life at sea, the science we do and other events of interest.